Heat or ice: What do you need for your pain? Home / Blog / Cryotherapy / Heat or ice: What do you need for your pain? Heat and ice can each be beneficial in different scenarios. Aches and injuries are never fun, especially if you're living with chronic pain. Depending on your condition, you may consider medication, physical therapy or even surgery or other invasive measures to find relief, but sometimes a simpler solution is possible. When it comes to relieving minor pain, heat and ice can both be useful in certain contexts. But before you try either, you need to recognize which is going to be more effective for your particular situation. When you apply something warm to your body, it brings more blood to the area. According to Johns Hopkins Medicine, heat can be helpful when your muscles are tight, because the higher temperature reduces muscle spasms and joint stiffness. However, when using heat to ease your pain, you need to be careful to avoid burns. If you use a compress made from a wet towel, for instance, make sure that the water you use is warm, not boiling. And if you are using some sort of electric device, like a heating pad, ensure that the hot components don't come in direct contact with your skin. Usually these kinds of devices have a cloth cover or something similar to keep you safe. While warmth can help relax muscles and decrease stiffness, Johns Hopkins emphasized that heat therapy shouldn't be used in the first 48 hours of an injury. To make ice therapy more comfortable, consider trying products from the POLAR ICE line. While heat offers a number of benefits for addressing pain, sometimes ice is the better option, especially if you're dealing with inflammation or swelling. "Ice seems cold, mean and uncomfortable. Heat seems warm, comfy and cozy," sports and exercise medicine physician Anne Rex said in an article for the Cleveland Clinic. "But ice wins for acute pain, inflammation and swelling. Heat perpetuates the cycle of inflammation and can be harmful." However, you need to be careful with these strategies. Ice that is applied too long can cause damage to the skin, nerves or tissue. Wrap any ice in a towel before applying it to the painful area. To make ice therapy more comfortable, consider trying products from the Polar Ice® line. 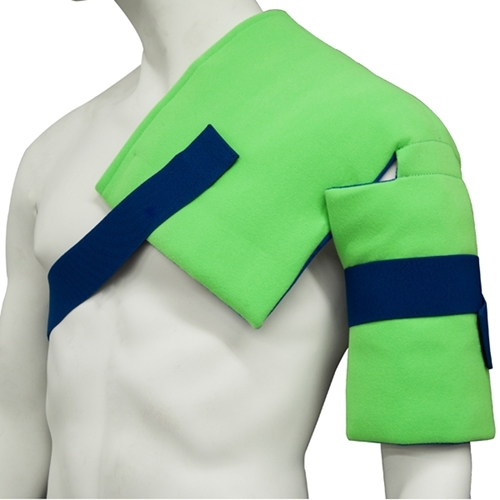 Created to help relieve pain due to post-surgical rehabilitation and other injuries, options like the Shoulder/Hip Wrap, Standard Knee Wrap and Back Wrap are easy to wear and insulated to prevent frostbite. The compression and cryotherapy of the products combine to help relieve pain and promote healing in soft tissue trauma. The simplest way to look at it is that heat therapy is usually helpful for reducing tension and stiffness, while ice therapy can help reduce inflammation and swelling. However, these options should only be used to treat minor pain from a known injury or condition. When in doubt, you should always consult with your physician, especially if the pain or swelling does not decrease within 48 hours.